Countryside red kidney beans with an excellent, light taste that’s ideal for savory dishes without much sweetness. You can use these versatile beans in a wide variety of ways, from hearty, filling stews to light and crisp salads. Interestingly, the “countryside” part of their namesake comes from how they were traditionally made there, they are carefully boiled down until all of the liquid disappears. This results in the skin breaking away, leaving us to enjoy the simple and pure taste of the beans themselves. 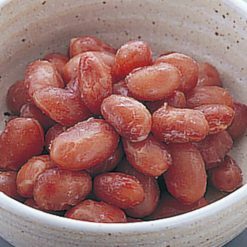 These Taisho red kidney beans aren’t just delicious, but also highly nutritious. Rich in iron, magnesium, and copper, they fill you up during your meal and then help maintain your body and health afterwards. Their high fiber content makes them an excellent addition for anyone’s diet. They are notable for being quite high in protein, and they make a tasty, healthy, and filling recipe when combined with rice or another grain. They are ideally thawed by being placed in the refrigerator, but can also be thawed under running water during times where you’re in a hurry. (If running them under water, please remember to leave them in the container until you’re finished.) Please store in a sealed contained in the refrigerator after you’ve thawed them, and consume them within a short period of time. They are delicious combine with steamed of fried rice, salt, assorted vegetables, and if desired your choice of meat, fish, or tofu. For a tasty alternative to hamburgers for vegetarians, or those who simply love beans, simply mash together our Countryside Red Kidney Beans, salt, garlic, onions, and your favorite spices together before lightly frying.To prepare hummus, blend beans, tahini (sesame seed paste), garlic, salt, and a touch of lemon. 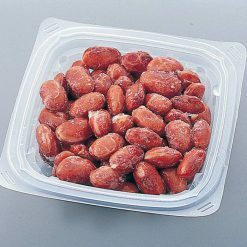 This product contains kidney beans (Taisho red kidney beans: Hokkaido), sugar, starch syrup reduction, salt. Origin of ingredients: kidney beans (domestic). Prepared and packaged in Japan.